Archery is a wonderful sport or leisure game, if you love the sun or the outdoors. Some clubs do have them indoor even with air-conditioning for shorter ranges. However the cost of running these clubs are high which are passed down to the end-users. Besides cost, some associated dangers are often in the mind of parents who don’t encourage the game for this lurking fear. The operation requires staff to retrieve arrows every now and then when the targets get clutter up. Trainers are also required to teach the basics to the beginners or just to station there for safety reasons. That’s when the idea of a virtual archery game started. During the release of an arrow, the energy of the string is transfer to the arrow thereby propelling it forward in flight. This energy is very great if you imagine an arrow that can travel between 100m to 160m depending on the type of bow used. If we simply pull the string and release it without the arrow, the energy is absorbed by the bow which can damaged the bow over time. The archer’s arm is also subjected to this harmful unused energy. In our virtual archery design, the arrow does not leave the bow but it is still there to maintain some feel for the real thing. The string tension is much reduced to avoid the high impact of an empty released. This may initially put off the die-hard archers but open the field to a wider audience especially the younger and the more senior age group. The skill level is however not diminished as with creative software programs, we can mimic the arrow flight path and off course do more wondrous things, as we know. With our customized bow, whatever your age group, you can enjoy this wonderful sport in the privacy of your living room or have a gathering to compete with your friends. 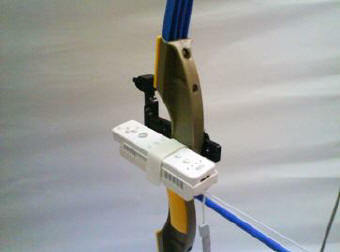 You simply aim the bow and arrow onto your current LCD monitor or better still, a plasma TV, let go of the release catch, and the display will show the location of the arrow on a projected image of the target. 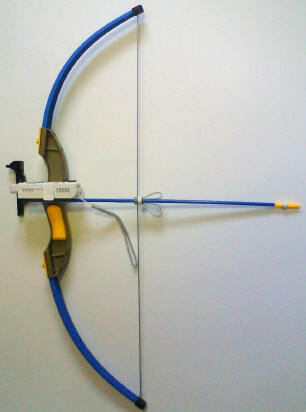 Yes, the arrow is fully secured on the bow with no possibility of any accidental release. Your kids cannot shoot each other, as the arrow is just a guide for the string release. Only an electrical signal is transmitted from the arrow attachment to a receiving console that will detect your arrow position upon release and compute the position on the screen. The range of the target, the number of players, the background of the range, the wind condition, and even night shooting with floodlights can all be program to suit your mood. If you are tired of the above, imagine shooting at deer in the forest, a rabbit or other surprises are all in the making. If you still find the above boring, then why not change the type of arrows. Imagine shooting a multiple arrowhead, intelligent arrow that can turn corners to seek designated hostile, with different degree of exploding ammo. Yes, you can also go online to compete with others around the world. On the hardware side, things are not stopping here. Ideas are in the works for more variety in designs, attention to details similar to archery like sights, counter weights, protection accessories. Designs simulating the current super-cool, fully accessorized titanium bow or the ancient bows used by Ghenghis Khan can be enjoyed at a fraction of the cost and in your own living room to avoid the funny stare.